In his first papal visit to the African continent, Pope Francis traveled to the Catholic stronghold of Kenya, where he put his progressive economic policies on display in a very Pope Francis way. After arriving in Kenya on Wednesday, the so-called People's Pope made it a point to call out corruption both in the East African nation and at his home at the Vatican, where Francis has been cracking down on abusive priests and the high-ranking clergy who enabled them. Francis also rented an unusual ride for this three-day visit — though considering his already eclectic legacy, perhaps it was not so surprising. 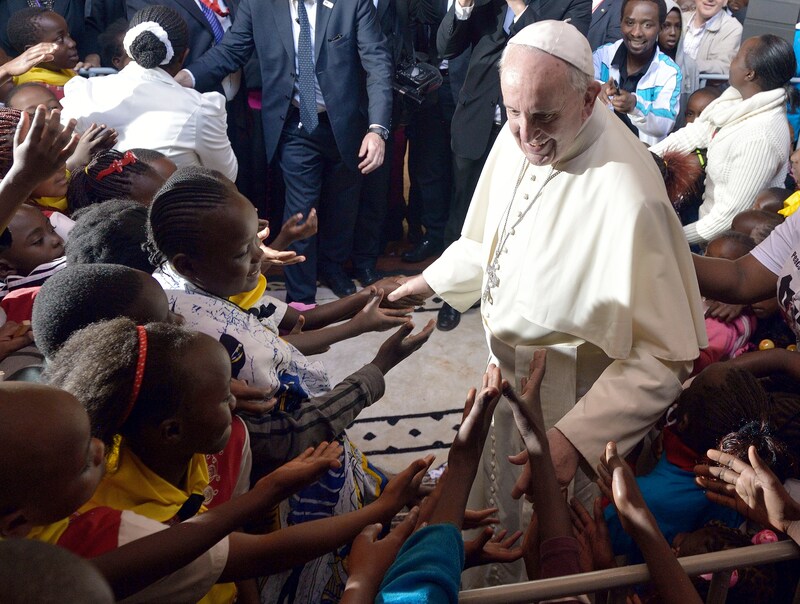 Much of Francis' Kenya trip focused on wealth inequality — a topic the pontiff is not too shy about. On Friday, his last day in Kenya, Francis met with groups of Kenyan youths, and warned them about corruption in "all institutions," including the Vatican. In a kid-friendly move, he compared corruption to sweets, leading to a "diabetic" nation. "Corruption is something that eats you inside like sugar. It's sweet, we like it, it's easy. And then we end up sick and poor," Francis said Friday. "So much sugar that we either end up being diabetic or own country ends up being diabetic." He added that corruption is led by the "spirit of evil," and condemned the "fanatical idealism" growing throughout Kenya and its neighboring East African nations. Kenya has been the site of numerous terrorist attacks in 2015, executed by Islamic militant groups Boko Haram and al-Shabaab. "How do we make it such fanatical idealism doesn’t take us to be robbed of a brother or a sister?" Francis asked, alluding to the child and teenage recruitment prevalent in both of these extremist groups. He warned the Kenya youths that life is full of "invitations that will lead you astray towards evil." By now, the world knows that Francis is not afraid to involve himself with domestic and international politics. Just two months after he address a general assembly meeting of the United Nations in New York, Francis met with the United Nations arm in Nairobi to once again warn against the dangers of climate change — the pontiff's latest platform. He largely took from his groundbreaking encyclical, Laudato Sì, published earlier this year, and advocated for an end to wasteful "throwaway culture." "We are faced with a great political and economic obligation to rethink and correct the dysfunctions and distortions of the current model of development," Francis told the U.N. in Nairobi. "Human beings – the Pope said – while capable of the worst, are also capable of rising above themselves, choosing again what is good and making a new start." But in the running for the Most Pope Francis Moment of the Year, Francis traded in his stylish Fiat for a Honda Civic Sedan — with no bullet proof glass. In fact, the pontiff reportedly rolled through Nairobi on Wednesday with the windows down. It represents another major departure from his predecessor, Pope Benedict XVI, who preferred to be chauffeured in a Mercedes Benz wherever his traveled. The modest Honda Civic sure made an impact in Kenya, where luxury vehicles are a show of wealth that most of the country can't afford. A Honda Civic is also cheaper than a Fiat, though this isn't the cheapest car Francis has ever driven; in 2013, Francis was gifted a used 1984 Renault 4, which he apparently uses to zoom around Vatican grounds. Still, what is more peak Pope Francis than touring a nation in an average Honda Civic?